A couple of weeks ago (has it been that long already? ), the great folks at Hidden Valley Ranch treated me to a fun, informative and — let’s be honest — a just plain relaxing retreat in Chicago aimed at helping moms Love Your VeggiesTM. One of the stops on our trip was the Gary Comer Youth Center. You may know that Gary Comer is the founder of Lands’ End. He donated 30 million dollars to build this after-school center for economically disadvantaged youth in Chicago. 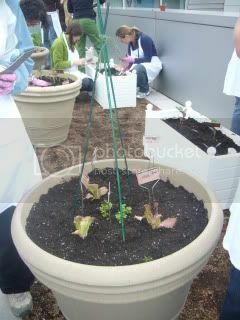 Cooking classes and rooftop gardening are among the after-school activities offered. The kids also receive homework help and career training. As I toured this beautiful, functional, state-of-the-art community center, I couldn’t help but think “There’s another great reason to shop at Lands’ End” (not as if I needed one). Knowing that the founder of this clothing company was so generous for such a worthy cause honestly gives me a higher overall opinion of the company in general. Now back to our time at the center named after the benefactor. . . . The rooftop garden at the Gary Comer Youth Center was amazing. We were able to dig in and get dirty, which was a lot of fun. 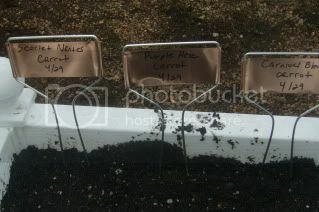 I planted this garden box with three different kinds of carrots. I wish that I had known about Jeanne Pinsof Nolan’s advice about using creative colors before we had purchased our plain old boring orange carrot seeds. However, we did decide to grow carrots because Kyle was so excited about them, but next year we are definitely going to try some cool colorful varieties. Read more of Jeanne Pinsof Nolan’s tips on gardening, and check out all the downloadable resources for classroom (or home) use available at Love Your VeggiesTM. Another fun resource that we’ve enjoyed is the Veggie Adventures game which gives children a true (and fun) appreciation of what it means for their food to go from Plant to Plate. I will be featuring more posts throughout the month with more information and nutrition resources from the Love Your VeggiesTM campaign, so stay tuned! Remember to check back all month for chances to win a Lands’ End swimsuit, and join us on Twitter tonight for the Island Giveaway #giveaway from 8:00 – 11:00 p.m. EDT. Written by contributing editor Jennifer Donovan, who also blogs at Snapshot and manages 5 Minutes for Books. Gardening with kids is such a fun experience! Thanks for the resources! That is so cool! Yay Lands’ End! Downloadable classroom pages……might be just the ticket.